I rarely think about band names, however the WO FAT band got me very curious, so I used my old and very smart friend Wikipedia. According to Wiki, Wo Fat is the name of a fictional villain in the long-running CBS series Hawaii Five-O, I did like the original series and the villain itself so I can understand the usage of the name. 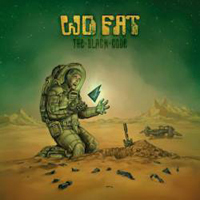 WO FAT comes from the US of A and according to their info they play Psychedelic Doom Metal / Stoner Rock. After listening to the album I can say that they play a straight forward Stoner Metal. WO FAT reminds me allot of KYUSS, TUMMLER, ACID KING and even some BLACK SABBATH riffing can be heard within their music with some additional Psychedelic grove to create a solid addition to the Stoner Metal universe. The album consists of five songs however do not worry about it, this is a Stoner band and most of the bands alike create long songs. I can say that “The Black Code” is the best song on the album with a Doom like riffing and a classic Stoner / BLACK SABBATH solo. The album is more than a solid one and it fits all people that share admiration for Stoner Rock / Metal music, however to others it probably won't appeal.